COVENTRY – The Coventry Board of Education has been awarded a $10,000 contribution from AT&T to support vocational training stipends to students at Coventry Academy. Coventry Academy’s alternative education program offers support for students seeking a non-traditional, non-college track post-high school. Vocational training is a major component at Coventry Academy. “As we explore opportunities to support students who require a less traditional path to experience success at the high school level, the funding from AT&T will afford our district a means to further enhance this work. Through the vocational training component at Coventry Academy, students will now have the assistance needed as they work to attain their goals. As a district we are fortunate to have the backing of AT&T to support our students.” said Dr. David Petrone, Superintendent of Coventry Schools. The AT&T contribution will support several small stipends for students in the Coventry Academy vocational training program, as well as cover transportation and other materials. The twenty students in the Coventry Academy program have an academic schedule that is customized to meet their individual needs. Their academic programming includes consistent support, which includes measures that ensure they are successful and develop the tools necessary to work toward independence. There is also a focus on team cohesion that includes team-building opportunities throughout the year. 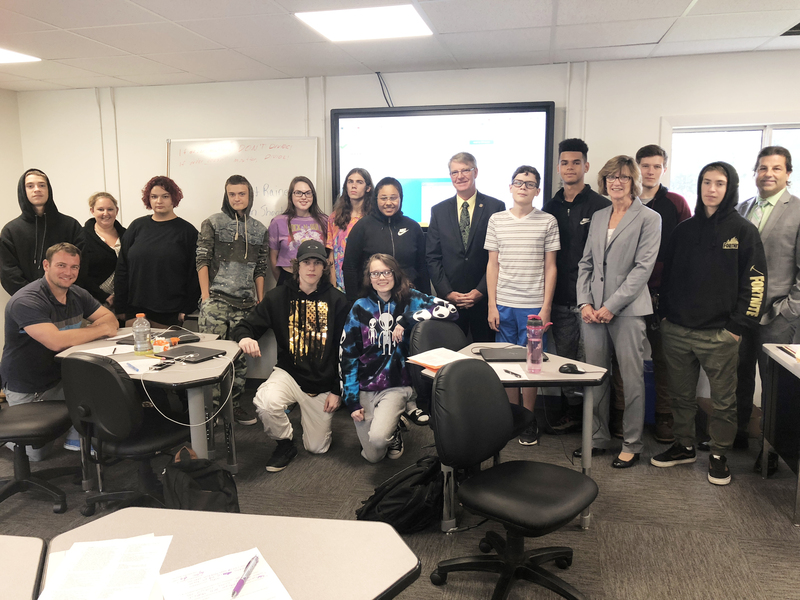 (Photo): State Representative Tim Ackert (center), Abby Jewett, Regional Vice President AT&T Connecticut (fourth from right), and David Petrone Superintendent of Coventry Schools (far right), stand alongside students in the Coventry Academy vocational program.